We still quite can’t believe we are actually here, despite exploring the island for three weeks. Writing the updates became part of our life during the crossing but since we arrived we just don’t seem to have been able to fit it in. English Harbour - We had a lot of fun in English Harbour with the billions of other boats that were there. 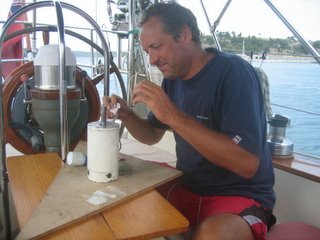 The weather was not quite what we had expected, every time we got in the dinghy to go ashore the heavens opened and we arrived looking like drowned rats. Nelsons Dockyard itself is beautiful and totally immaculate, we really enjoyed wandering around, especially after all the tour parties had left in the evening. We spent a lot of time here working on the boat but tried to have a bit of fun everyday. We took a couple of hikes - one to Shirley Heights and another over the cliffs to Pigeon Beach in Falmouth Harbour. The scenery was amazing on both, we walked though the woods to Shirely Heights which was all vines with jasmine trees and cactus. The second hike was tougher because we were more exposed to the heat - but it was stunning walking along the cliffs and the swim at Pigeon Beach worth it. 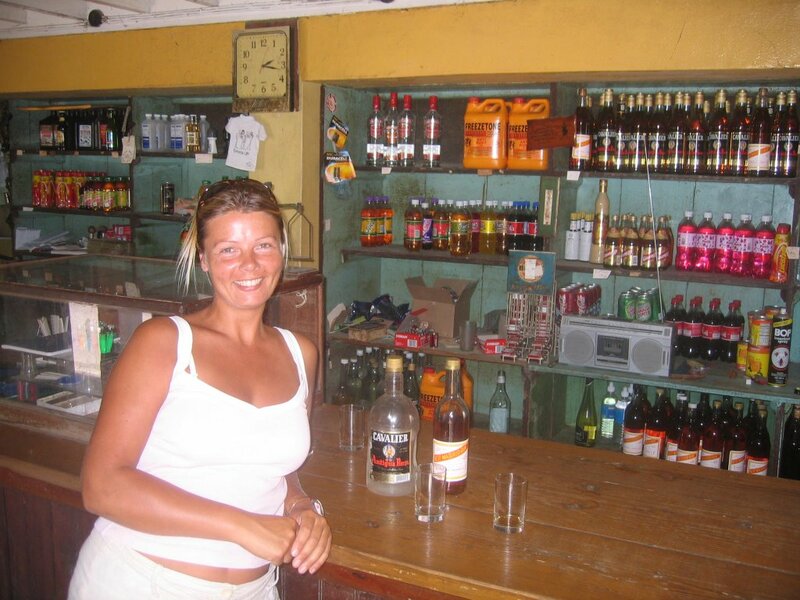 One evening we snuck ashore for a rum cocktail and met the Antiguan Tot Club. This is a group of expats who meet every night to drink a tot of rum and toast the queen - we were invited to join them and it was a lot of fun. 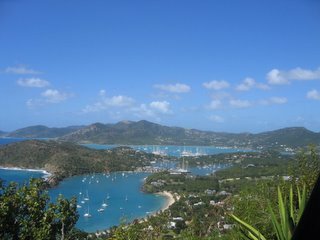 Non Such Bay - After all the hussle and bussle of English Harbour we were ready to escape so we took the long trip (9 miles - into the wind) to this expanse of water on the south west corner. 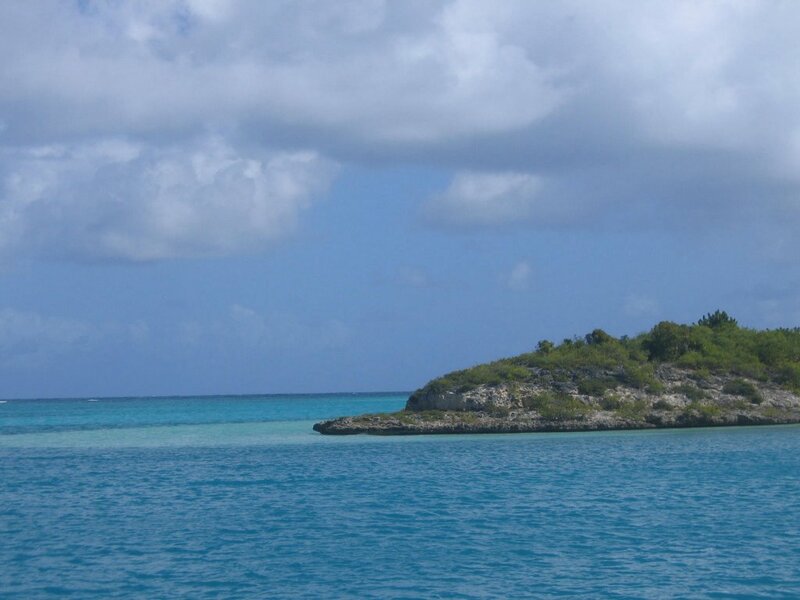 The bay has lots of small bays and creeks and is open to the Atlantic other than a reef which is virtually solid. We had our first experience of a reef pass to enter the Bay which was actually fun as we had to do proper navigation rather than just watch it on the computer (a bit unsettling for me but Andrew loves the close nav). 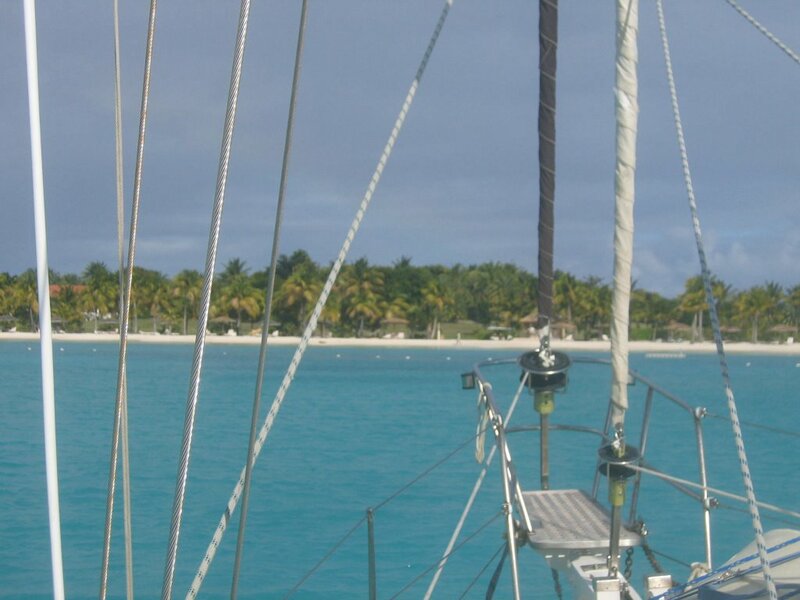 We anchored alongside a couple of super yachts just off Green Island and were blown away by the beauty - this is the sort of stuff they put on the front of holiday brochures. Flat calm sea changing blue, green, tourquiose, white as it laps against a perfect white beach fringed by palm trees and a few token rocks just for effect. Wow - this is the paradise we had dreamed of. 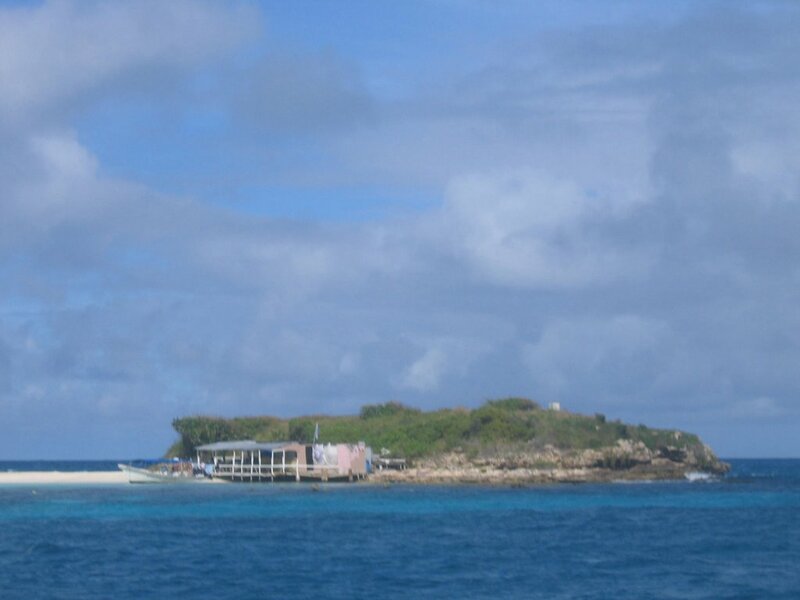 The super yachts cleared off, we swam on the reef and we had a BBQ with just 2 other boats in sight. We went exploring around the bay in the dinghy and treated ourselves for a special lunch are Harmony Hall. In true cruiser style we turned up at this really very posh place with our garbage for them to dispose of - and they did without question. Food was amazing and we had a lovely afternoon being very spoilt. 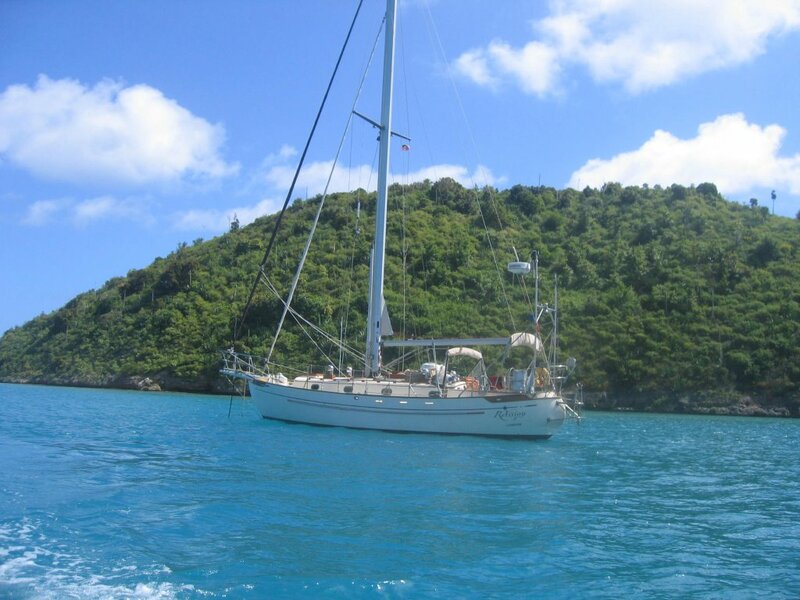 When the wind increased from the steady trade winds we hid away in a mangrove creek for a couple of days. We were right in so close you could nearly touch the trees with just pelicans and fireflies for company. The pelicans are wild, they sit in the trees and just watch you, then all of a sudden they take flight and seem to chuck themselves at the water with a huge splash that makes you jump. The fireflies lit the creek up at dusk like Christmas lights - I’d never seen them before and they were really special. While in our private creek we removed, disassembled and rebuilt the wind generator which died after the pounding it got on the crossing. Now it is all painted and has new go faster stripes and it is working better than ever now. 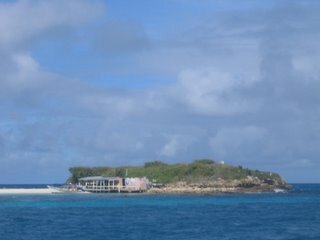 North Sound - This area runs on the north east coast of Antigua alongside Non Such but you have go out of the reef and right around the north of the island and back in along the reef to get there. We had a great sail after we picked our way through the narrowest winding reef pass which put my heart in my mouth all the way - especially when a squall hit us so we could see nothing for about 10 minutes. We anchored off the perfect beach which belongs to the island which is home to the exclusive Jumby Bay resort and millionaires homes. 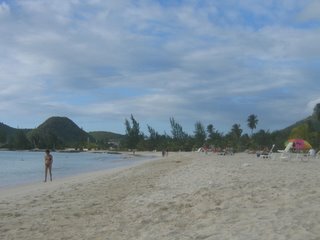 Beaches in Antigua are all public so we were able to explore a little but the resort were not keen to welcome us. Andrew thought it would be fun to take a football on the beach and tried to persuade Kathy & Ian anchored next to us to join in. 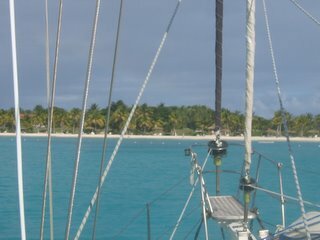 Instead we enjoyed the reef in our kayak and sampled the local rum onboard Ariel - the beautiful Wylow that Ian & Kathy built themselves. Our next stop in this area was to Parham. Parham used to be an important port but is now a sleepy village where we met the loveliest local people and had chicken & rice lunch for just 2 GBPs. We hoped to spend a night at the remote area east of Parham just off Bird Island but the wind was swirling through the rocks and we didn’t think we would be able to leave R2 to go and explore so we found a quite corner further in where we could get the kayak out again. Then on to Deep Bay - Just a lovely semi-circle bay with the wreck of the Andes in the middle. We had a lovely relaxed evening here. Jolly Harbour - Back into civilisation and a pretty beach. 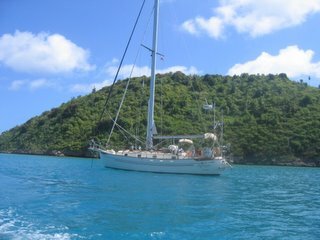 As we arrived in Jolly Harbour we saw both Ariel & Storm Along anchored off. I think we gave a few boats cause for concern as we weaved between the other boats to say hi to our friends. Nell & Brian on Storm Along came and helped us moor in the marina and we then all went out for lunch. Then we went to explore the chandlers and facilities at this purpose built marina and resort which has everything from a casino and helipad to darts to laundry to offer! Yesterday we took the local bus to St John’s which is the capital of Antigua. The bus (minibus) runs along a defined route but not to a schedule. It waits in the bus station until it is full (that is completely full) and then sets off so you don’t know quite when you are going to get anywhere. Its fun and cheap. We spent the day exploring St Johns. We mistakenly ended up in a crowd of people off a cruise ship and got hounded by the welcoming committee to go sight seeing. It was quite funny but we wont make that mistake again. We walked out of town to the Antigua Recreation Ground home of West Indies Cricket. 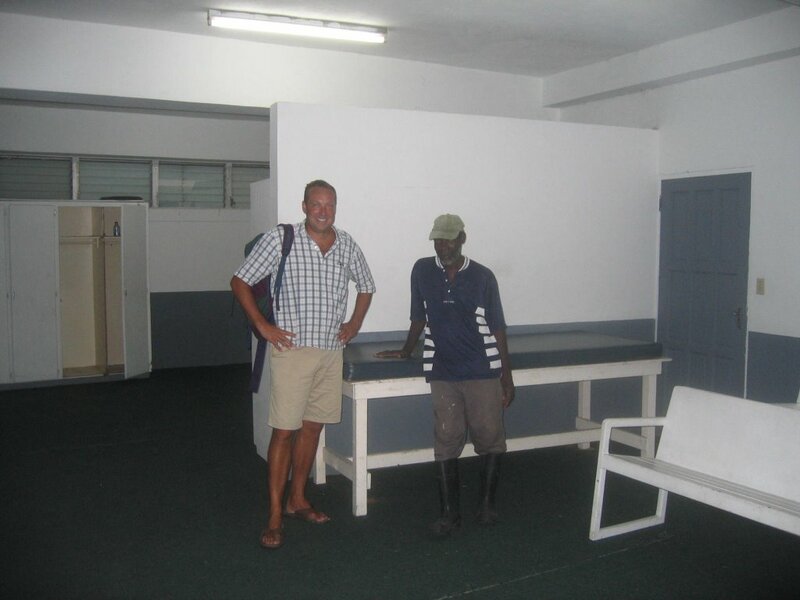 As is typical of the place we just wandered in and were met by the caretaker, Emanuel George. 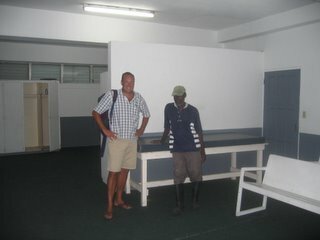 He was kind enough to give us a personal tour which included the changing rooms, lunch pavillion and out onto the field. They are busy preparing for two games against England later this month. We later stopped for a local lunch of curried goat and steamed fish. 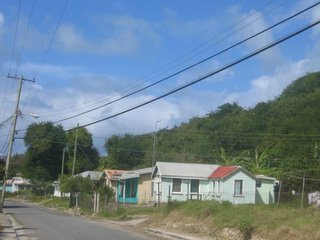 Everywhere you go in Antigua people stop to enquire where you are from and how you are enjoying Antigua. It must be one of the friendliest places in the Caribbean. On the way back we got off the bus in Bowlans village to go to the post office ran by John. In addition to the mail he runs a bar, petrol station, cooking gas depot and any number of other enterprises from the same premises. He also buys over strength Rum from the Antigua distillery and makes his own product in a vintage cask. It's there in the picture between the engine oil and antifreeze...That’s why we were there. We were able to sample some very special Bowlans Rum and enjoyed John’s company very much. We bought a gallon just under eight quid and John threw in 4 grapefruit from his garden for good measure. Just to make sure it was good we made up some cocktails in the thermos and went to the beach to test the quality! Today we are preparing for a trip to Europe. Looks like -2 C in London so think we will need socks with our flip flops.